Mignet Pou-du-Ciel Model (Literally “The Flying Flea ”or “Louse of the Sky”) The Mignet Pou-du-Ciel model in the museum is a representation of a family of aircraft designed by Frenchman Henri Mignet. The odd name comes from the French nickname for the Ford Model T automobile, “Pou de la Route” meaning “Louse of the Road” because Henry Ford’s economy car was so common and initially only came in the color black. Henri Mignet dreamed of creating a Model T of the air, an airplane for the common man, hence “Pou du Ciel.” In the English translation, the term became “Flying Flea.” Originally the description was applied only to his model HM.14, but the name began to be applied to the entire family of aircraft of a similar configuration designed by Mignet and others. 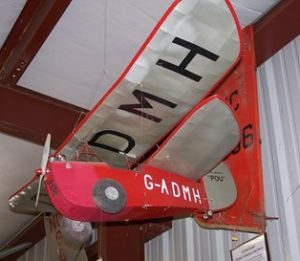 Between 1920 and 1928, Mignet built various prototypes from the HM.1 to the HM.8, a monoplane that was the first of his designs that really flew. In 1933, Mignet successfully flew for the first time in his HM.14, the original flying flea, and publicly demonstrated it. In 1934, he published the plans and the building instructions in his book, Le Sport de l’Air. In 1935, it was translated into English and circulated in Practical Mechanics in the USA, prompting hundreds of people around the world to build their own Flying Fleas. Mignet’s original HM.14 was powered by a 17 HP Aubier-Dunne two-stroke motorcycle engine. It had a wingspan of 19.5 feet, a length of 11.5 feet, and a gross weight of 450 pounds. It had a usable speed range of 25-62 MPH. Mignet designed the aircraft intentionally simple. 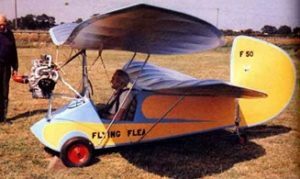 The Flying Flea was essentially a highly staggered biplane.